You don’t have to be stuck with chopping and stacking wood for your fireplace. At Uintah Gas Fireplaces, we offer convenient alternatives to keeping your home warm and cozy during the cold months. We can turn your existing hearth to a gas fireplace with our energy efficient gas logs in Utah. A gas log is a convenient way of adding a fireplace in your home, even if you don’t have an existing hearth. A gas log resembles a burning wood but without the mess a wood fire creates, such as ashes and soot. This contemporary fireplace is perfect for creating the illusion of having a traditional hearth and mantel at home. 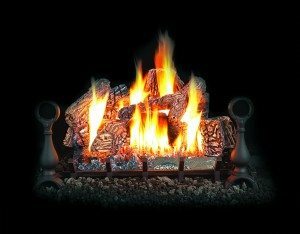 At Uintah Gas Fireplaces, setting up gas logs is easier with the help of our highly trained staff. Our gas logs are easy to use and maintain. Simply turn on the gas and light a fire. You don’t have to stack logs at home or worry about cleaning up after putting out the fire. In addition, you don’t have to restock the fire to maintain your preferred temperature. Burning gas is better than burning wood, as you don’t have to worry about sparks flying into the chimney or starting fires in the house. In addition, gas logs don’t cause a buildup of creosote. As you’re not using firewood, you can prevent termites from spreading around your home. With our gas logs, you can keep the traditional look of your fireplace without worrying about maintaining a wood fire. Contact us for more information on our gas logs in Utah and other contemporary fireplaces.